Angela recently agreed to share our blog on a website called Shanghai Bloggers. I was initially excited about the prospect of sharing our blog with a larger community, but then I felt a little bad about being a ‘seasonal blogger’. By this I mean we typically only post after we’ve taken an exotic vacation somewhere, and we have a lot of pictures that we need an excuse to share. This led me to the decision to write a post about our normal lives, which for the past few weeks have seen some interesting activities. The first activity that Angela and I like to make a habit is wandering around our neighborhood. It is amazing how many interesting things there are to see. Take exhibit A above for example. This is a sweet cafe on Xiangyang Lu where you can order coffee to go right from the sidewalk, next to that awesome antique bicycle. It is sort of like an old fashion McDonalds. Angela asked me not to post the below picture, but I did it anyway. She found a puppy in a yard on Taiyuan Lu, which was another point against me in the ‘no pets in China’ discussion. I was mostly amazed that this person had a yard to begin with, let alone a puppy in it. Another activity that I have come to love is bicycle around Shanghai. I used to hate it, because I thought it was dangerous, but the more adventurous I become, the further I ride, the less populated and more pleasant it is. Sometimes I talk Angela into coming along, and she is always glad (afterwards). We are training to ride our bicycles across the state of Iowa this summer on RAGBRAI. During this bicycle ride, we did something new and exciting. We biked to the Huangpu river, and then we took the ferry across to the Pudong side of Shanghai. It was the fastest ferry experience of my life, and it only costs 2.80 RMB to cross. That is less than $.50. I had never ridden around Pudong on my bicycle, and Angela likened it to entering ‘Pleasantville’, as nobody was honking at us, it was quiet, and everyone just seemed more polite somehow. We ended up following the Huangpu north for many miles, and we discovered that you could ride almost without seeing other humans for miles along the river. It was a priceless discovery. Something else Angela and I do in Shanghai is teach music. In fact, that is the thing that we do the most in Shanghai. We are nearing the end of the school year, which means that we both had a final performance. Angela and I both have two nights of concerts. I had a night of guitar, along with the percussion and choir, and a different night of band, which was shared with the orchestra. The orchestra teacher and I teamed up to combine our high school band and orchestra classes to perform ‘Pirates of the Caribbean’ and ‘Harry Potter’. The music was challenging, and the kids loved it. They put on a great show. Angela has a concert with the 2nd and 3rd graders, and another music concert with the 4th and 5th graders along with her coworker Sean. 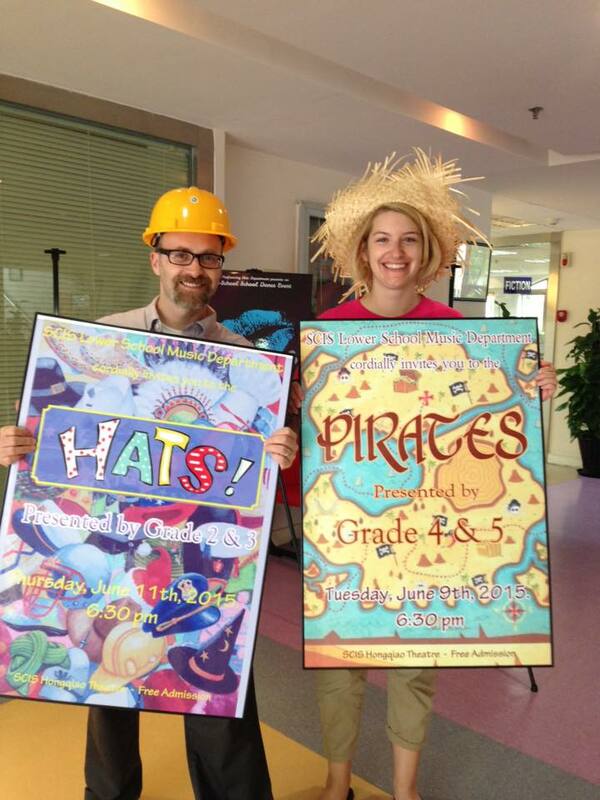 They are putting on two killer shows; ‘Hats!’ and ‘Pirates’. I am making a guest appearance on the banjo for ‘Hats!’, but I haven’t seen much else of these two magical shows yet. I am anxiously awaiting the performance day. I had a couple of performances this week that were not school related as well. I joined up with a large community choir that was performing Haydn’s Nelson Mass. I am not much of a singer, but this group sometimes hurts for basses, so this is the second time in two years that I have sung with them. They seek me out every semester, and so far have only put me in the front row. I don’t know if it is because I am an exotic foreigner, or if they are somehow confusing me for somebody that is better at singing, but they are under the false assumption that as a music teacher, I am a good singer. This time, I talked some of my friends into coming along, both of which are actually good singers. We rehearsed as a choir, then joined up with a small chamber orchestra for the performance of the mass. Much of the early rehearsals are done in Chinese, but there are some friendly gentlemen in the bass section that are glad to help when we don’t understand what is being said. The company always brings in a professional conductor, and the experience is always very good. We performed at the Oriental Arts Center in Pudong. It was a good performance, with a pretty full audience. I was kind of nervous! Friday night I had a gig with the big band that I play in. For the first time ever, our big band (The Shanghai City Swing Band) played at the JZ Jazz Club. I have gone to JZ to hear a lot of other groups before, but I had not yet had the opportunity to play there. It was a fun place to play, and within walking distance of my apartment, which was an added bonus. 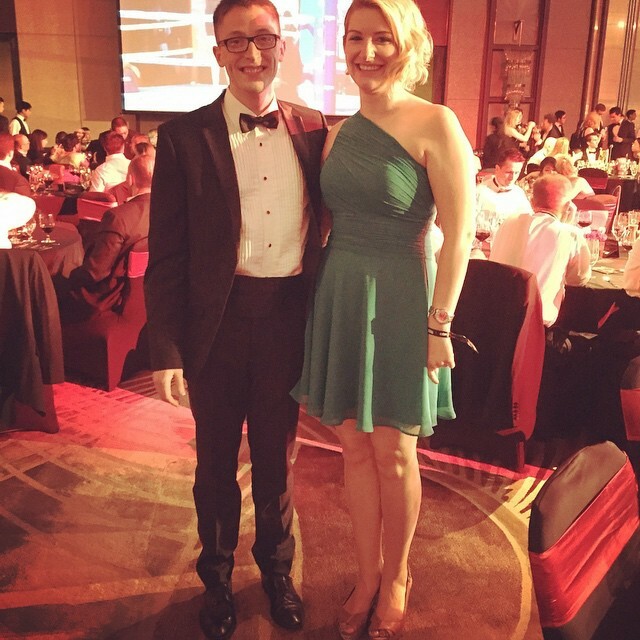 For our final activity on Saturday night Angela and I went to the ‘Brawl on the Bund’. This event went against the pacifist teachings of the Quaker side of my family, so I may not be telling my grandfather about this one. It is perhaps the fanciest thing I have ever been to. The meal was fancy, and during dinner you get to watch nine amateur boxing matches. I was prepared to see some brutal fights, but it was a lot less violent and more athletic than I thought it would be. The boxers were mostly trying to land punches to score points, and there were no knockouts or teeth flying into my drink. One of the boxers was a teacher from my school! The best part of the evening in general was getting fancy and hanging out with our good friends. All in all it has been a great couple of months, but Angela and I are both excited to be back in dear old Iowa again. All for now. We’re excited to have you in Iowa again! And RAGBRAI comes pretty close to Iowa City this year, so I’m hoping we get to hang out!